Traditionally, Ajrakh is the name of a block printed cloth with deep crimson red and indigo blue background, connecting symmetrical patterns with interspersed unprinted foaming white motifs. The term “Ajrakh”, is obtained from “Azrak”, meaning blue in Arabic, as blue happens to be the one of the principal colours in Ajrakh printing. More than a fabric, Ajrakh is a Sindhi tradition, found in daily usage such as hammocks and bed sheets to duppattas, scarves, and even gifts as a sign of respect. 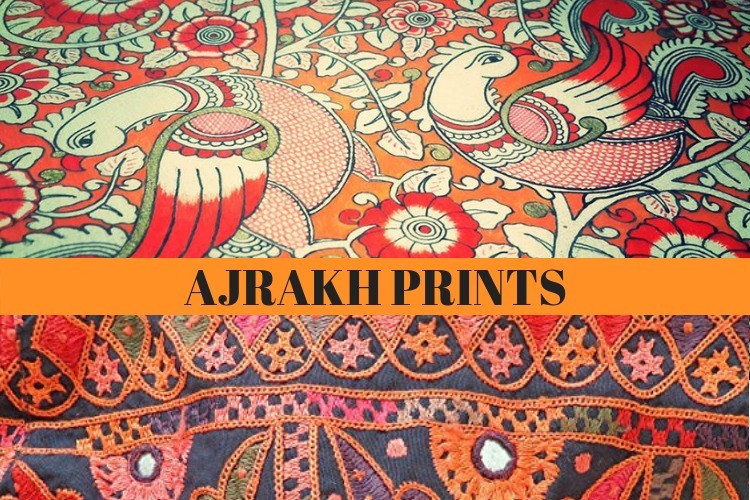 Ajrakh creators claim that their craft dates back to early medieval times. Pieces of printed fragments which were believed to be risen from western India, were unearthed at Fostat near Cairo. The Ajrakh craft was skillful curated by the Khatri community, living on the banks of river Sindh. The Ajrakh fabric is generally about 2.5-3meters in length. Authentic Ajrakh is marked on both sides by a method called resist printing. The printing is finished by hand with hand carved wooden blocks. Different blocks are used to allow the characteristic repeated patterning. Creating the blocks is a significant challenge since the pattern has to concur perfectly with the whole fabric as well as cover various areas opposed to dye. The Ajrakh print is employed within a grid, the repeated pattern creating a web-like design or the central jaali. Apart from this jaali, border designs are also engaged in the fabric. These borders are placed both vertically and horizontally and around the central field, distinguishing one ajrakh motif from another. The lateral ends are printed using a wider, double margin in order to modify the layouts of borders. The printing blocks have to be much chiseled by a specialist in the field. A set of three blocks generate a dovetailing effect which finally results in the design. They are designed from the Acacia Arabica trees, indigenous to the Sindh region. The repeat pattern, which allows the design its character, is decided by a grid system. The pattern is first transmitted the block and then carved with great precision by the block-maker, who uses very simple tools. The blocks are carved in pairs that can register an exact transpose image on the other side. Water is essential to the production of Ajrakh cloth. Artisans take the cloth through a process that can involve over thirty separate steps as first the cloth is produced, then mordanted, then dyed. Through each stage, the character of the water will affect everything from the shades of the colours to the success or failure of the complete process. This craft has been reducing because modern, quicker methods of printing and bright chemical dyes are replacing the natural, muted colours and slow and careful process of printing this traditional textile. But with work of the master craftsmen and increasing knowledge among the urban people, this craft is slowly gaining momentum again. Due to its environment friendly primitive nature, Ajrakh, is slowly attaining visibility among the cosmopolitans.